In the High Sierras, most campers are backpackers, carrying minimal gear and exploring the high country on foot. It's an appealing idea, but that kind of travel isn't for everyone. If you would love to see the mountains up close but think camping is what people did before God invented hotels, Yosemite's High Sierra Camps are a great way to see the Yosemite backcountry without having to sleep on the ground every night. 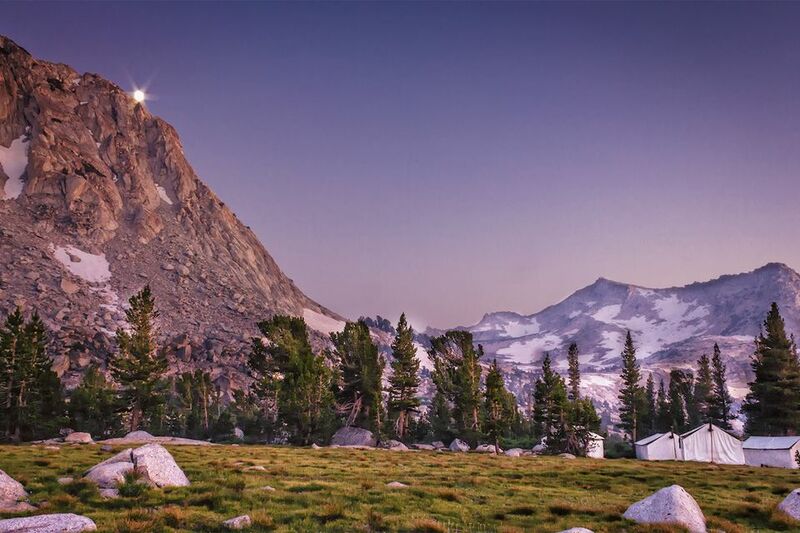 Yosemite's five High Sierra camps are arranged along a loop in Yosemite's High Country. They are six to ten miles apart and set up to be a day hike apart. They are open from late June through September, depending on the weather and snowfall. Lodging at the High Sierra Camps is in canvas tent cabins with dormitory-style steel-framed beds. They provide mattresses, pillows, woolen blankets or comforters but bring your own sheets or sleep sacks. It may not be the Ritz, but it's better than sleeping on a hard rock. Parties of less than 4 people may have to share a cabin with others. The High Sierra Camps serve a full dinner and breakfast family-style. You can also order box lunches in the evening, to take on the trail the next day. If you take your own food, using the food storage lockers at the camp is mandatory, to keep the bears out. Hot showers, soap, and restrooms are subject to water availability, but no matter what, you need to bring your own towels. Glen Aulin and Vogelsang camps have no showers. To visit the camps, most people start at Tuolumne Meadows Lodge, then hike to Glen Aulin Camp, May Lake, Sunrise, Merced Lake and Vogelsang, then back to Tuolumne Meadows. You could also hike it in the opposite direction, or hike out to just one camp and back. If you hike the entire loop, you'll cover 49 miles (79km). High Sierra Camps' season is short and varies by year. Occasionally, snow lingers so late that they don't open at all. So many people want to stay in them that demand outstrips availability. To give everyone a chance at the experience, reservations are assigned by lottery. To stay at the High Sierra Camps next year, fill out a lottery application online in September and October. Exact dates are posted on their website. If you can't get in through the lottery, you can also sign up for a waitlist. The more flexible you can be with your dates, the better your chance of getting in. If you can't get a space through the lottery, consider a backcountry guided trip. Scheduled multi-day trips are available with a National Park Service Ranger Naturalist. Custom trips can be arranged through the Yosemite Mountaineering School. Or if you'd like to see the sights but the hiking isn't for you, try a 4-day or 6-day saddle trip to the High Sierra Camps. Guests are limited to 225 pounds, which includes their body weight and everything they're carrying. If you don't mind the hiking but don't want to carry the gear, the saddle trip folks will take it in on one of their regular supply trains for a few dollars per pound. Get the rates and schedule here. High Sierra Camps require serious hiking skills and the elevation is very high. Get ready by walking or hiking with the pack and shoes you plan to use. To help prevent altitude sickness, stay at Tuolumne Meadows or White Wolf a day or more before you start and increase water intake starting a week before your trip.